Okay. I’m gonna be honest with you. If you have babies or toddlers, flying basically blows. Don’t kid yourself. No amount of cutesy sandwiches cut into the shapes of butterflies or Dollar store toys or card games or coloring books is going to stop your trip from being a living hell. If your children aren’t attempting to climb into the seats of every passenger within a 6 foot radius, or shrieking at the top of their lungs because you somehow managed to forget their favorite Dora pencil eraser, or trying to lick every surface in the airplane restroom, or attempting to kill their sibling with a Bob the Builder screwdriver, or kicking the seat in front of you to the beat of Old McDonald which they insist on singing at top volume, then doubtless you will be cursed with a flight attendant or seatmate who will hate you just on principle, even if your children are being perfect angels. Don’t try to fight the system. Instead, join in the fun. Your trip will be a whole lot easier. I promise. 1.If at all possible, see if the airline will let you crate them and board them as pets. 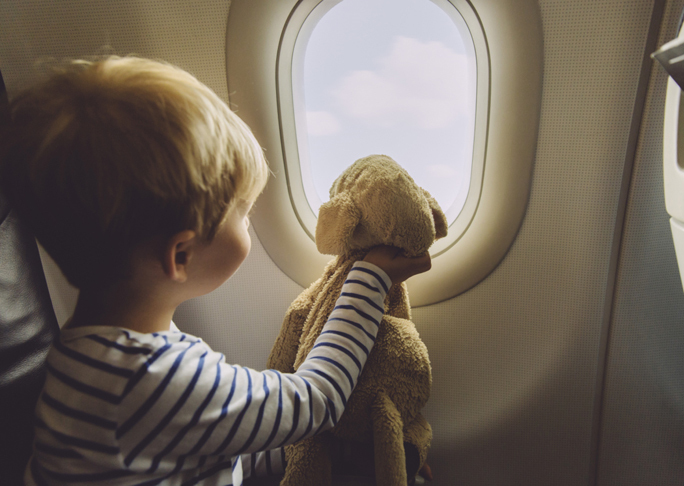 People on airplanes are typically much more tolerant of pets than children. 2.If this doesn’t work out, pretend you don’t know them. When the passenger next to you asks why you are allowing your children to dig through his carry-on and make paper airplanes out of his Day Planner, look shocked and confused. Then quietly go back to looking out the window. 3.Embarrassed by all the noise your children are making? Don’t be. Just make sure to bring an activity that is louder than your children. A couple of blenders and some power tools will usually do the trick. 4.Don’t bother yourself with bringing lots of special toys and activities for the kiddos. Your children will only find them entertaining for about 3 minutes anyway before they become obsessed with what’s inside the carry-on of your seatmate, ripping the In-Flight Magazine into tiny pieces, and/or pouring the contents of their sippy cup onto the motherboard of your laptop. 5. But if you do bring one thing, make it a DVD player. There’s nothing like some good ole TV sedation to keep the kiddos dazed and drooling. Leave the Your Baby Can Read DVDs at home, K? This is not the time to break out the fosisticated, educational programs. Make sure to bring lots of mind numbing winners like Sponge Bob Square Pants and Yo Gabba Gabba. With these peyote- inspired winners, you’ll be sure to buy yourself a good 22 minutes of calm. 6.When your baby has the diaper blowout of the century, don’t waste time searching for the changing table. Most planes don’t have them anyway. Just change your baby right there in the middle of the airplane. It’s okay. Everyone hates you already. 7.When the flight attendant comes around at snack time, don’t bother asking for healthy toddler-friendly juice or milk. Encourage your children to get the most sugary, caffeinated beverages available. This will guarantee you at least 5 minutes of peace while your children enjoy a private bonding moment with their very first Coca-Cola. 8. Afterwards, expect to pay in spades for what you’ve done. But don’t give up hope. Just join in the festivities. You might be surprised at how much fun it can be to do somersaults up and down the airplane aisle. 9. Don’t forget to test out the inflatable plane seats and oxygen masks. These also make great toys and will keep your toddlers busy for at least 5-7 whole minutes. 10. If the flight attendant scolds you for having the worst behaved family in the history of flight, just smile and nod. If nothing else, at least you had a good time.